After a crazy week that included eighty-degree heat, a visit to Dr. Seuss's garden, classes on the craft and business of writing at the New England SCBWI spring conference, a visit with family, mountain hikes in both sunshine and snow (yes, snow), and a stint at the Albany Book Festival, I'm back online. My trusty work-in-progress manuscript accompanied me through all my recent adventures--from the summery to the wintry--providing its own special complications and joys. "All the good things that have happened to me in the last several years have come, without exception, from a willingness to change, to risk the unknown, to do the very thing I feared most. Every poem, every page of fiction I have written has been written with anxiety, occasionally panic, and always with uncertainty about its reception. ... I have not ceased being fearful, but I have ceased to let fear control me. I have accepted fear as a part of life, specifically the fear of change, the fear of the unknown." -- Erica Jong, "Blood and Guts: A Woman Writer in the Late Twentieth Century," from What Do Women Want? And for some thoughts on spring as related to the writing life, here's my post at YA Outside the Lines on "Spring, romantic (or not)." Today I was privileged to visit with a class at a New Jersey college: a children's-literature class that had read The Secret Year. This is absolutely my favorite kind of author event: visiting with classes or book clubs who have read one of my books, and it's why I typically don't charge for such visits. 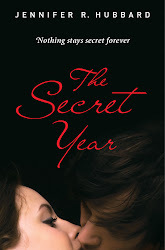 I've been so focused on Try Not to Breathe, which just came out in January, and the new manuscript I'm currently working on, that I haven't spent as much time lately hanging around in the mental world of The Secret Year. It was fun to go back. As I remarked to Toni DePalma, I have more detachment from this book--in a good way--because of the time that has passed. I still care about the book and its characters, but I'm less possessive and defensive, more accepting of different interpretations. I've realized that every reader brings his or her own experiences and expectations to a text, and what happens in a reader's mind is only partly directed by the author. And I'm okay with that. The class made such intelligent, thoughtful comments about the book--and about secrecy, grief, and obsession (its major themes). They didn't always agree, and had some lively debates about whether Colt really matured by the end of the book, and what Julia would have done had she lived, and Michael's motivations for a certain act toward the end of the book. A few of the comments surprised me and made me look at my book in a new way. We also talked about how YA literature has evolved, and how cover designs and marketing have changed, and about censorship and edginess. In short, it was a delight: such experiences are among the best parts of being an author. This is a nice note to go out on. I'll be temporarily "unplugging" from the internet for about a week, as I do a couple of times a year. When I return, I'll resume reading blogs but won't be able to catch up on all I'll miss in the interim, so if anything big happens to you this week (book sale, babies born, moving your blog to another address), please leave a comment below so I'll be sure to see it! 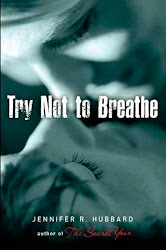 I won't go on at length here today, since Angelina C. Hansen (YA Scribe) posted an interview with me today--and a giveaway of Try Not to Breathe! She asked me about behind-the-scenes influences on the book. A sample: " ... sometimes during drafts, I will look up the answers to very specific questions, things I need to know to fill in holes in a draft. (For example, for Try Not to Breathe: How expensive is it to go sky diving? How old do you have to be?)" Please check it out if you like. Also, for your viewing pleasure, a compelling trailer for Joelle Anthony's upcoming YA, The Right & the Real. I don't watch a lot of trailers, but I loved the bold images and the music in this one. Not to mention, it sounds like a compelling read! The one who shows up to your book event even when it is two hours from her house and a rainstorm keeps everyone else away, and stands loyally beside your signing table all night. She also tells the one customer who enters the store that your book will change his life--and not in a scary way, but in a friendly way that makes him buy the book and take extra bookmarks. The one who listens to your 45000th lament that you have no talent, you don't know what you are going to do with these characters, and you have been thinking of becoming an electrician anyway. The one who tells you that sour reviewer doesn't know what he's talking about. The one who reminds you of that one writing tip you need to hear at the moment you need to hear it. The one who makes you talk about stuff when you don't really want to talk about it, but you need to. The one who doesn't make you talk about stuff when you need to forget about it for a while. The one who calls when she finishes reading your book and tells you it made her cry. In a good way. The one who admits, "Yeah, me, too," when you tell her you sometimes feel like an impostor who has no business writing books, and you realize that since she's such a good writer, this feeling is perhaps not entirely reliable. The one who brings chocolate. The one who cheers your good news. The one who doesn't complain about not hearing from you while you are in a revision cave. The one who doesn't complain about getting a flurry of email when you are in a writing crisis. The one who makes you laugh. Thank goodness for them all! This shocked the audience ... but she made her point: she was making art, not documenting an event. That she chose to tell her own extraordinary story was of secondary importance." This excerpt is from Ann Patchett's book Truth & Beauty, about her friendship with Lucy Grealy. The above exchange, reported by Patchett as taking place at a live author event, is in reference to Lucy's Autobiography of a Face: her 1994 memoir about surviving a bout with cancer that left her with half a jaw, and how the physical changes to her face affected her. This discussion must have taken place around 1994, and it reflects something I have heard from memoirists and writers of creative nonfiction for years: This is an art. Liberties are taken with details in order to tell a greater truth and make a readable story. The irrelevancies, red herrings, detours, and distractions that clutter up life are smoothed over or omitted in order to showcase the story that the writer is focusing on. Split ends are fused; sequences are adjusted for the sake of flow; the raw story is polished until it shines. Some nonfiction books point this out explicitly, putting the reader on notice that names and identifying details may have been changed, the sequence of events altered. Some characters may be composites. Dialogue is not necessarily verbatim. Other times, these changes are not spelled out. And different writers have different standards for how much they consider it acceptable to change or emphasize or omit. In recent years, the "creative" aspect of creative nonfiction has come under more and more fire, especially as the line between journalism/reportage and creative writing has changed. I believe the standard for anything presented as news reporting is still that it must be factual, and quotes must be verbatim--at least, I certainly hope so. Reporters are allowed to mask names with aliases in order to protect sources or witnesses, but the actions, the numbers, the events and their sequence must be correct. But what of essays, memoirs, and the like? There the line is fuzzier. As a reader who loves such works, it has been clear to me that artistic license is usually taken, but I'm not sure it has been clear to most readers. And that's probably where the greatest problem lies: readers want to know how much is literally true. Whatever license is taken, the audience should be on notice about. I published one creative essay in my career, and I did not consciously change anything in that essay. This doesn't mean that the piece is necessarily flawless, only that any errors would be an oversight, or a failure of my memory or observation. I did not deliberately change anything for creative effect. I didn't feel comfortable doing so, and frankly I didn't need to, to get across the point of the essay. However, that is only the standard I used for myself as a writer in that instance. I'm not trying to put forth a rule for all writers (not that anyone's asking me to be the arbiter of writerly truth!). I do think writers should be having this conversation, though: how many liberties can one take with nonfiction before it becomes fiction? And how can writers make clear to readers where they drew the line? NJAN multi-author panel/Q&A at Cherry Hill Public Library, 1100 Kings Highway North, Cherry Hill, New Jersey 08034-1911, on Monday, April 16th at 7pm. WRITING FOR YOUNGER READERS: Local authors share tips and information on getting published in today’s YA, Middle Grade and Children’s markets (organized by the New Jersey Authors Network).Join New Jersey-area authors, Kelly R. Fineman; Gregory Frost; Jon Gibbs and Jennifer R. Hubbard, for a fun, informative discussion on writing for younger readers, and the various options available to writers in today’s market. Often when I read the biographies or letters of writers, I find out about times--especially early in their careers--where they read voraciously and studiously. They read and reread, tore through the entire oeuvre of author after author, checked out their favorite writers' influences. They memorized poems or passages. Sometimes they imitated their literary heroes for a while. They compared and contrasted their favorite writers with other writers, figuring out what made one style appeal to them and another not. I'm reading some of Jack Kerouac's early letters at the same time I'm rereading Ann Patchett's Truth and Beauty (the story of her friendship with Lucy Grealy). I'm going back and forth between the books because sometimes that's just how I read. And on one hand, I have Kerouac discussing Wolfe and Tolstoy with his young writer friends, and comparing inward-looking authors with outward-looking authors. On the other hand, I have Ann Patchett and Lucy Grealy at the Iowa Writers' Workshop, talking books and trading writing ideas, Lucy memorizing passages from One Hundred Years of Solitude. So many writers start with a love of books, and at some point they move from just enjoying them to studying them--although the studying is also a form of enjoyment. It brings to mind my multiple rereads of The Catcher in the Rye, trying to figure out how Salinger tapped into such an incredibly strong voice. Studying Kerouac's The Dharma Bums and Visions of Cody and Desolation Angels to catch the rhythm, to realize how important rhythm is even in prose. Picking apart Carson McCullers's The Member of the Wedding to see how she managed to imbue seemingly ordinary events with larger significance. Learning about symbolism and taking the story where it needs to go from Golding's Lord of the Flies. Despairing that I would never be as skilful with English as Vladimir Nabokov, even though it's my first language and wasn't his. Practically jumping out of my chair at the big reveals in A Tale of Two Cities (the secret of Mme Defarge's knitting) and Invitation to a Beheading (when we discover M'sieur Pierre's occupation--I mean, seriously, is that not the most awesome scene EVER, literarily speaking?). The library is our school, and we never stop learning. But there's something special about those early times, and the books we read then, the books that become our own influences. Occasionally while roaming the internetz, I'll see someone tearing into the idea of the Muse. Generally what they're tearing into is the idea of some inspirational sprite that will only alight when conditions are perfect, like a speshul snowflake landing on the writer's (immaculately groomed and glitter-dusted) eyelashes. And their rage makes me laugh. Because when I talk about the Muse, I'm mostly kidding. Longtime readers of this blog may remember imaginary conversations I've had with the Muse, which were ways for me to complain about this crazy avocation in an (I hope) entertaining way. But here's the aspect of the Muse about which I'm serious: She isn't some airy sprite who floats into the writing office sprinkling fairy dust and bestseller ideas. For me, she's that inner voice that says, You must write this story. As in: You must WRITE, instead of the fifty other useful things you could be doing. As in: You must write THIS story and no other, because this is the story that is nagging to be told. As in: YOU must write this story, because nobody else will write it quite this way. The Muse is not sweet and fragile. She's tough. She has an attitude. She puts the story first. She tells you to for Pete's sake stop worrying about what everyone else is going to think about your work, and just write it already. Yes, tell the scary parts and the sad parts and the parts that will make people squirm. Be fearless, or at least write as if you are. I’m going to coin a term here: buzz-hunting. Buzz-hunting = trying to answer the question, “How’m I doing?” via the internet. (Or, similarly, “How’s my book doing?”) It includes self-Googling but so much more: Google alerts, blog stats, web stats, reading nomination lists, reading reviews, checking rankings and ratings, etc. I gather there is a thing called Klout that will assign a number to your alleged online influence. There are many ways to buzz-hunt, but those are just a few. I call it buzz-hunting because the hunter is not only seeking buzz about him- or herself, but because it can also be used to obtain mood-altering emotional hits. I know there are people who can mine all these data with perfect equanimity, who can use it to craft promotional strategies and make decisions about how they invest their online resources. Then there are those for whom buzz-hunting is just an emotional roller-coaster. I’ve always tried to be selective about buzz-hunting: only to engage in it when I’m feeling centered and ready to accept whatever I find; not to waste too much time doing it; not to let my well-being be determined by what I find. I try to do it on my own terms, and consequently I’ve never used alerts, for fear of having negative things thrown at me when I’m not ready. But back in February, I reached an unhappy place with it. It happened to be Ash Wednesday when I decided I wanted to step back from it, and so I decided that, even though I haven’t given up anything for Lent in years, this would be a good year to do so. And I figured that giving it up would increase my availability for inner reflection, which would also be in keeping with Lent. The one thing I explicitly allowed myself was my weekly Bookscan check, because I use those numbers for actual practical things such as royalty projections, which help with my estimated taxes. Except for that and a couple of lapses (hey, I’m not perfect), I did manage to keep my resolution. It was, in some ways, like being in a vacuum. My mind was quieter. I developed a passionate curiosity about a few pieces of information I would’ve liked, but I also had an overwhelming sense of relief. My books were out there, making their own way, and I did not have to agonize over how every single reader received them. A few kind people sent me fan tweets or emails (which are always appreciated), but I was not following all the quantitative measures by which we can rank ourselves on the internet. One thing I’ve noticed by never having alerts is that, if anything really big and wonderful happens, somebody will email me about it. YALSA list nominations; big writeups in the paper; state list nominations: when they happened, I found out about them eventually. Now that the season is over, I’ve made a short list of the kinds of buzz-hunt measures I do want to track—a much shorter list than my pre-Lent habits. And I’m willing to give those up again if they make me unhappy. The weird thing about buzz-hunting is that even when you find only good stuff out there, it doesn’t necessarily lead to satisfaction. Sometimes it triggers a craving for constant reinforcement. By saying all this, I’m not saying that buzz-hunting is bad or that nobody should do it. I’m just sharing my own experience in case it is helpful to anyone else. Everyone has his or her own comfort level with this stuff. I do want new writers to know that if other people tell you you have to get Google alerts or track your blog stats or whatever: No, you don’t have to. You can, and you might like it and find it helpful, but it’s up to you. My husband and I took a hike in a park today. So did hundreds of other people. It's not uncommon to encounter people hiking on the woods trails, or bicycling, pushing strollers, and walking dogs on the flatter gravel trail. We saw all of that today. What was uncommon was the guy decked out in tam and kilt, standing on an outcropping of rock, playing the bagpipes. Bagpipes evoke strong childhood memories in me, because I had a relative who was a bagpiper. So today, my husband and I sat on a bench with a good view of the piper and listened for a while. It was one of those random, inexplicable things that just happen. Maybe it will end up in a story (the inevitable thought that writers have when encountering the unusual, the unexpected, the memorable). Maybe it won't. In real life, it was just a surprising, touching, enjoyable break, brought to me by a total stranger whose motives I don't know. In a story, it would have significance of some sort, and the character would be known to me, his mind and motives accessible. In a story, everything has meaning. In life, too, everything has meaning, but we cannot know the full story of the world; we only know little pieces of the parts that directly concern us. The rest, we fill in, or walk away from never knowing the answers. Be amazed by the world. At the moment, I'm in a listening and observing mood. I'm mulling over some changes in a story I've been working on. And so I'm attuned to the inner voice, which is sometimes necessary, and is the most useful writing tip I can offer today. Along with this from Jon Gibbs: Don't forget to have fun! 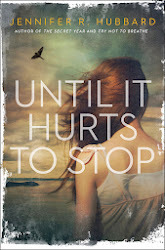 Finally, if you haven't already, please visit my library-loving giveaway, which is still open. As things stand right now, chances are excellent that if you make a donation to your library, I'll end up matching it (see the post for more details).